Summary: When Jacob discovers clues to a mystery that spans different worlds and times, he finds Miss Peregrine’s Home for Peculiar Children. But the mystery and danger deepen as he gets to know the residents and learns about their special powers. Tim Burton fans it is time to rejoice because the man of creepiness is back with a film that once again sees him using his creative genius to full effect. The last few years has seen Burton serve up films like Big Eyes and Dark Shadows – films that to be honest have been a waste of his talents. With Miss Peregine’s Home For Peculiar Children though Burton once again lets his creativity come to the fore as he delivers a film that is visually appealing and brings some ‘older’ special effects back to life. Based on a novel by Ransom Riggs Miss Peregine’s Home For Peculiar Children centres around Jake (Asa Butterfield – Ender’s Game) an unpopular teenager who has been brought up listening to his ­Grandfather Abe’s (Terence Stamp – Wanted) tales of a miraculous island that he once lived on. Jake’s father, Franklin (Chris O’Dowd – The Sapphires) tells him these tales are part of his Grandfather’s dementia but Jake finds himself wondering whether or not they are true when he finds Abe brutally murdered and he witnesses a ‘monster’ at the scene. 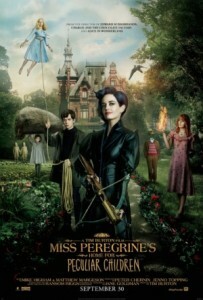 Soon Jake finds himself discovering that Abe’s stories are true as he meets Miss Peregrine (Eva Green – Dark Shadows) a mysterious shape shifter who looks after a school for children with peculiar abilities, such as Emma (Ella Purnell – Never Let Me Go), and makes sure that the ‘loop’ they live in resets each day. While at first Jake believes their lifestyle is picturesque who soon becomes involved in their dangerous war with the psychotic Barron (Samuel L. Jackson – Pulp Fiction). On the surface it would be very easy to dismiss Miss Peregrine’s Home For Peculiar Children as a mish-mash of Harry Potter and X-Men but with Burton at the helm this film becomes much more than that. Burton’s finger-prints are all over this film from start to finish. While the opening scenes of the stale white store where Jake works seems largely un-Burtonesque it gives way to a world where Burton can bring a steam punk feel to a World War II bombing raid, use ‘jumpy’ special effects during a scene of re-animated dolls fighting and use old-school CGI to bring skeletons to life for a large scale battle. To some younger cinema goers the use of the ‘older’ effects may seem a little strange it does fit the film’s storyline of flashing between time periods… and better still it’s Burton being his creative self. Storywise the film does have a fair bit to get your head around. While the time-jumping sequences will be very quick to lose you Burton gets away with it by the fact that Jake himself doesn’t fully understand what is happening either. Generally though this is your typical good versus evil storyline with a touch of coming-of-age as the audience gets to experience Jake’s first romance as well. Under the watchful eye of Tim Burton the cast here regularly get a chance to shine. While Butterfield’s performance is nowhere near as intense as his performance in Ender’s Game he still does a good job. Likewise Samuel L. Jackson is far from his best but seems to be having fun as he plays the menacing Barron. The real standouts here though are Eva Green and Ella Purnell. Purnell announces herself as a star of the future with a performance very similar to what Burton normally gets out of Mia Wasikowska. Green plays Miss Peregrine as a sultry character that we can only help returns to the screen soon. Whether Miss Peregrine’s Home For Peculiar Children is meant to kick-start a franchise or simply be a one off movie the film holds its own as Burton delivers a film a little too dark for children but something that adults and young adults will certainly warm to. This surprisingly good film sees Burton return to do what he does best – produce a creepy yet truly creative film.